From the windswept beaches of Corolla to the serene mainland vineyards, Currituck County is known for its abundance of spectacular wedding destinations that highlight the natural beauty of the Outer Banks. The November holiday gives rise to the same images each year – family gathered around a large table, falling leaves in warm colors and turkey . . . lots of turkey. But for families who live on and visit the Outer Banks for Thanksgiving, the special day has taken on new elements of a coastal nature. Ocean and sound are only the beginning of what Currituck County has to offer. In fact, there are so many off-the-beaten-path activities that just pondering the choices is entertaining. Hand-line crabbing is a quintessential Currituck family tradition. Here are 12 more great family traditions in Currituck County, for just about any time of year. The Outer Banks has long been a premier spot for destination weddings, and this has recently become especially true on the northernmost stretch known as the Currituck Outer Banks. With the wild Spanish Mustangs roaming free and the wide expanses of pristine shoreline, much of it accessible only by four-wheel drive, it's easy to see how the Corolla area beaches were recently voted #1 by online readers of Coastal Living magazine. 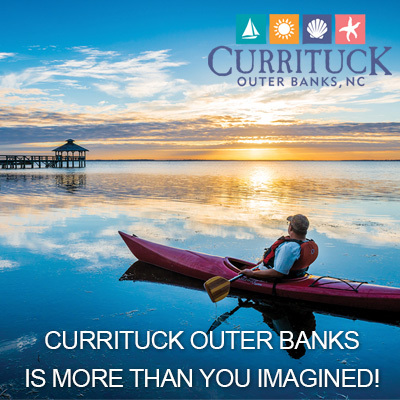 © Currituck County Department of Travel & Tourism 2019. All rights reserved.